More than faster lap times or race wins, safety is what keeps motorsports going. Comfort affects the performance and safety of the racecar driver. In this regard, Stand 21 is committed in finding and testing new materials, options, and processes that will help develop the most ergonomic and safest products. This is why the “Heat Stress” research program began in 2004 and set multiply connections with the medical world, especially through the “Racing Goes Safer” foundation. Because of constant motorsport technical evolution, Stand 21 keeps up with the latest research, developing new products that exceed customer expectations. It is on the track that Stand 21 has become what it is today: the technical partner of racing drivers concerned with safety and any parameters affecting their performance. For us, in terms of safety, technology and the medical aspect are one. That’s why our R&D department works hand in hand with motorsport medical specialists (MD. Trammell (U.S.A.), Prof. Meistelman (France), Prof. Trafford (UK), Dr. Mineo Kawasaki (Japan)... Thanks to this work ethic and latest-generation manufacturing equipment, Stand 21 products have passed the highest standards in motorsport today (FIA, SNELL, SFI, CIK ...). HEAT: The racing driver's enemy. Nelson Piquet appears exhausted on the podium after his victory. It is by witnessing this kind of situation that is encountered not only in closed cars racing, that Stand 21 was incited to evolve from the concept of “Passive Safety” to “active” or “proactive Safety gears manufacturer. We adopted an active approach in managing safety factors related to the dangers of race car driver, that is why in the 80s we developed and used a new fabric which up to now still has exclusive engineering features that captivate immediately back then the interests of all Formula 1 drivers as well as the drivers of other categories.The concept is simple: the more comfortable a racecar driver is inside his safety gear, the safer he will be while increasing his racing performance.The fight against heat stress started. The "Heat Stress" scientific and medical research program initiated by Stand 21 in 2004 allowed a sophisticated data gathering, resulting in drastically improving the performance of the Stand 21 products to manage heat stress. Stand 21’s heat stress research clearly showed the danger of rising core-body temperature. As perspiration evaporation is hindered by impermeable fabric layers in underwear and racing suit, the body temperature rises, causing diminishing brain functions and hindering the driver’s ability to control his racing car. This situation arises even when racing in a low-temperature environment. After Stand 21 published its Heat Stress tests results, most of the participants in the motorsport community became aware that a fire retardant racing suit was not solely a means of protection against fire, or an advertising medium. A properly engineered suit ventilates the body and can be a key factor in a racecar driver’s overall performance. Indeed, even in open-cockpit cars, the driver's body temperature will gradually rise, considering that the controlled airflow is generally oriented to cool down the mechanicals and little attention is paid cooling the driver. 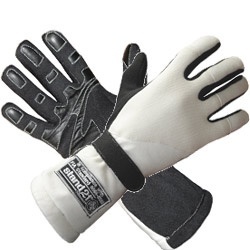 Many racing teams and organizations through their own programs have largely corroborated Stand 21’s findings, that to efficiently and safely complete in a race with a consistent performance level, and delay physical and mental impairment, even a talented and well prepared racing driver need highly technical, very comfortable and very breathable personal equipment. University of Nancy (France) Professor. member of the Safety Commission of the FIA. at the Twin Ring Motegi. In recent years, Stand 21 validated its findings on the race track, as top-level racing teams (Corvette Racing, Porsche Motorsport, All German Motorsport, Alan Johnson Racing…) were impressed by the HSC (Heat Stress Control) racing suits and underwear because of their breathability and the resulting significant gains in drivers performance. For racing teams, investing large amounts in better braking or suspension systems to improve the car’s performance can be hindered by the their driver’s diminished performance from suffering heat stress or injury caused by inadequate personal equipment.